Tomorrow, our library is hosting an original Sherlock Holmes escape room on the Princeton University campus. Kids ages 9-14 will race the clock, solve puzzles, and uncover something Mr. Holmes has hidden from a nefarious group of businessmen. We’re not giving any clues away, but I did want to share something cool. 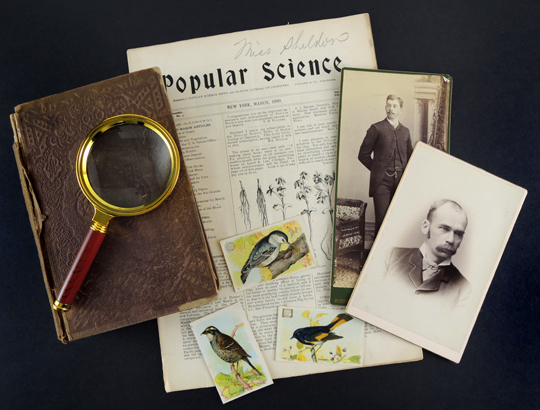 Some of the puzzles involve actual period materials, like this copy of Popular Science from 1889, the book from 1850, and the photos and bird trade cards from the late 19th century! We are delighted to report that the escape room was a rousing success! You’ll find all the details, puzzles, and final solution here. This entry was posted in More Connections by Dana Sheridan. Bookmark the permalink.